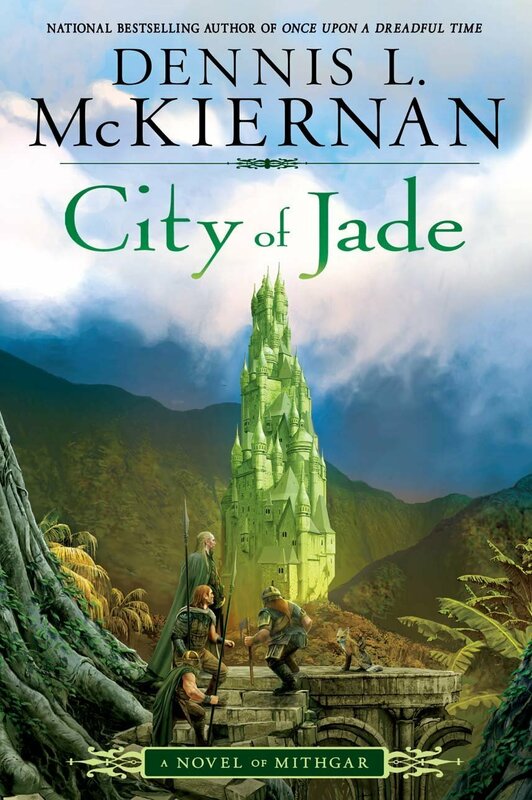 Foreword to "City of Jade"
Back when I began the Mithgar series, I didn't know about Aravan and his Elvenship, the Eroean. I wrote The Silver Call and The Iron Tower completely ignorant of that magnificent ship. Then I wrote Dragondoom, followed by Tales of Mithgar, and it was in Tales in the very last story"When Iron Bells Ring"that the name Aravan first appeared, though we only saw the name and little else of that Elf. But then I wrote The Eye of the Hunter and there he wasAravan, a crucial member in the search for Baron Stoke. It was here we first learned of the Eroean and of some unknown tragedy that lay in Aravan's past, and of the disappearance of that splendid ship. What had happened, none knew . . . but Aravan held subdued grief in his eyes, and his ship was among the missing. It was when I went back in the history of Mithgar and wrote The Voyage of the Fox Rider that we first got to sail on that Elvenshipwith its crew of forty men and forty Dwarves, and a Pysk and two Magesand sail we did, over much of the world. It was also there that we discovered why grief dwelt deep in Aravan's gaze, and where the Eroean had gone when it vanished from the world. Once I discovered where the Eroean was, I realized then that Aravan had indeed sailed on the Eroean during the Winter War, a war at the center of the story told in The Iron Tower. And so when the book was revised, I added a single paragraph telling of Aravan's mission during that conflict. However, after Voyage of the Fox Rider, we didn't get to sail on the Elvenship again through three more Mithgarian novelsThe Dragonstone and the two books of the Hèl's Crucible duologybut finally we reboarded that craft in Silver Wolf, Black Falcon, and then once again in Red Slippers: More Tales of Mithgar. And so, of the many books about Mithgar, in only two (or perhaps three) have we really spent time with the crew on the decks of the Eroean. This storyCity of Jadeis about to rectify that dearth, for an untold adventure in that mislaid city was first mentioned in the opening chapter of Red Slippers, and many of you have pestered me to recount that tale, for once again you would voyage across the seas of Mithgar on the fastest ship in the world, with her Elven captain and Mage mistress and crew of forty men and forty Dwarves, and her scoutsa fox-riding Pysk and a Warrow or two. So unfurl all sails and heel to the wind and we'll get under way. Oh, and yes, bon voyage, my friends. Bon voyage to all.